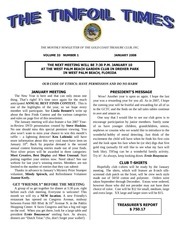 This PDF 1.4 document has been generated by Microsoft Word - june2008pageone.doc / ÿþS c a n S o f t   P D F   C r e a t e !   , and has been sent on pdf-archive.com on 10/08/2017 at 22:22, from IP address 104.145.x.x. The current document download page has been viewed 229 times. creates a dilemma: HOW can I keep track of it all? newsletter for additional information about KollectAll V8! for volunteering to try to stump us with the Mystery Item. 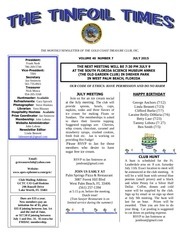 discussed at the June club meeting. in a designated parking space. Parking is free until 9 a.m.
Anna Maria Island with the theme Md'ers Helping Md'ers. which is located on the south end of Anna Maria Island. topics: Equipment, techniques, tips, and show and tell. More information will be available at the meeting. metal detectors for sale at palmbeachmetaldetectors.com. benefit our club and its members. Call 561-743-5248.
machines in top shape with less than 10 hours usage. 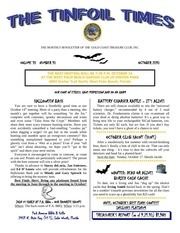 Club members can advertise items for sale or items wanted, free of charge. have to be related to metal detecting. Contact Linda Bennett to place your ad. Lorraine of The Treasure Depot. amount of trash we have collected during our hunts. meeting! It’s a dirty job, but somebody had to do it! big winners, our club dominated the Shootout! year’s GSBS. We’ll see YOU in the winner’s circle! provided delicious refreshments for our meeting. looked like it had been bombed 14 to 15 inches down! reward from the happy owner! Way to Go!!! hunting on the beach, move on to another beach. area tends to get the most traffic. Good Luck! appetizers at the Crazy Gator on Lake Eustis. dangerous animals to beware of while metal detecting! on the severity of the encrustation. aluminum foil, and a glass or Pyrex bowl. pour boiling water on the baking soda. Watch it bubble. q-tips to finish the cleansing. And then shine the coin. encrusted coin in ammonia for a few hours or overnight. and gently rub the coin. dipping my fingers in a mild liquid soap. On the Bottom of the Ocean! thumb, so we decided to stop and take a look. photographic opportunity for underwater shutterbugs of any shipwreck along the east coast of Florida. I was certainly impressed. few bronze crosses, medallions either worn by sailors or else trading material. particles up with the tips of my fingers but couldn’t reach deep enough into the cracks. The others had the same problem. tow it out to the site?” That brightened everyone up as the most logical solution. salvage crew. It took us almost an hour to reach Rio Mar, and we cast loose the barge close to the location of the field of gold dust. After that it was up to the barge crew. 100 feet away and heard the sounds of hushed excitement as we went about our business. panning for gold on the bottom of the ocean.